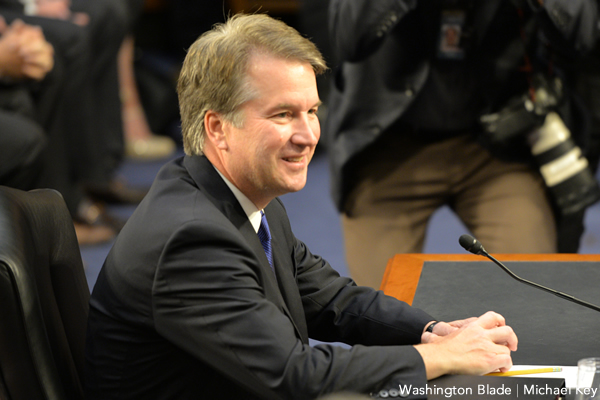 In the aftermath of powerful testimony from Christine Blasey Ford asserting she’s “100 percent” Brett Kavanaugh sexually assaulted her as a teenager, the Senate Judiciary Committee on Friday voted to advance his nomination — although a deal is in the works for an investigation before his final confirmation vote. The Senate panel approved the nomination on 11-10 party lines. Republican members insisted on moving forward with the nomination despite objections from Democratic members, many of whom called for delay until the FBI could conduct an additional investigation. The lynchpin that allowed the nomination to move forward was Sen. Jeff Flake (R-Ariz) — but there was a condition for his support. Although Flake signaled earlier in the day he’d vote to confirm Kavanaugh, he said he agrees with Democrats an FBI investigation is warranted and would only vote on the floor for the nominee if at least one week is given for its completed. “I’ll move it out of committee, but I will only be comfortable moving forward on the floor until the FBI has done more investigation than it has done already,” Flake said. Flake acknowledged he has no power to block floor proceedings on the Kavanaugh nomination, which is the jurisdiction of Senate Majority Leader Mitch McConnell (R-Ky.). But without Flake’s vote on the floor, the Kavanaugh nomination would almost certainly be in jeopardy. Other moderates in the Senate on both sides of the aisle — Sens. Susan Collins (R-Maine), Lisa Murkowski (R-Alaska), Joe Manchin (D-W.Va) Heidi Heitkamp (D-N.D.) — may also take the opportunity to withhold support for Kavanaugh on the floor without the completion of an investigation. A “no” vote from these senators would doom Kavanaugh’s confirmation. In a statement from the White House, President Trump said he had directed the FBI to pursue the investigation, although it will be limited in time and scope. Kavanaugh said he’d cooperate with the FBI investigation just as he had with previous inquiries in a separate White House statement. Faiz Shakir, political director for the American Civil Liberties Union, commended Flake in a statement for agreeing to the FBI investigation.